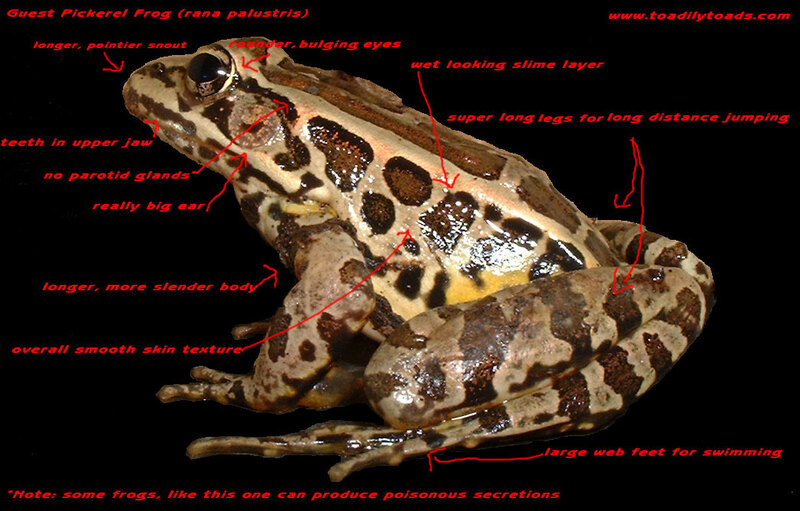 Toad vs. Frog Biology - How to Tell a Frog from a Toad. How to tell the difference between frogs and toads. There are two schools of thought on this issue. One is that there really is no difference between frogs and toads and that toads, which belong to the family called bufonidae, are nothing more than just another branch in the family tree of the anuran world. The other school of thought is that true bufonidaes have a somewhat different body composition and physical requirements which were the criteria for earning them a seperate label in the first place and they are seen as profoundly different. Either way, one can argue that each family in the anura order are distinct yet similar, hence why they are all pooled under the anura class heading. There are profound differences between true frogs and tree frogs, for that matter. Putting all the science aside, I personally like to point out the differences in more layman's terms. Also, in my opinion, toads are very different in overall intelligence and temperment. Toads are extrememly smart and toads are much more human like in personality, but these are just generalizations since I have known smart frogs and not so smart toads, as well as toads with no personality and frogs who had alot of personality. Take a look at the pictures below to see the unique identifying features of most true Bufos. Below that is a picture of a pickerel frog (rana palustris) who we found while looking for toads recently. We didn't want to keep him, just borrow him for pictures for this page. He did a fine job and was surprisingly mellow and well behaved, for a frog! I guess once we explained that he would be the model and representative for all ranas here on toadilytoads.com, he put his best flipper forward. 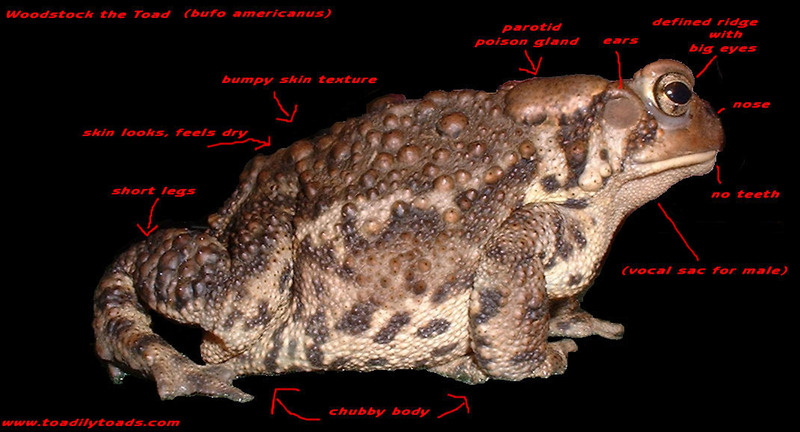 PS: click here for a page on differentiating male from female toads.